Since it was announced late last year, the world had been eagerly awaiting the wedding of HRH Prince Harry and Meghan Markle on Saturday 19th May. Now, to celebrate the Royal event of the year, a brand new British Isles £5 Silver proof coin has been released. 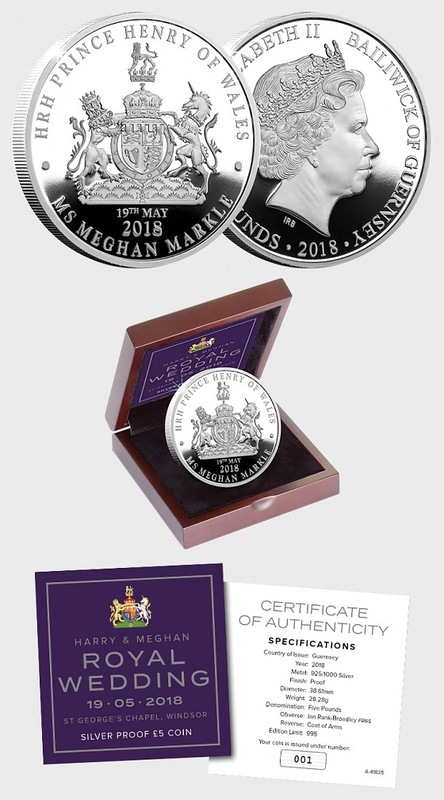 Struck from 28.28g of Sterling Silver to a stunning proof finish, this coin has been officially approved by Her Majesty the Queen. The reverse design features Prince Harry’s personal Coat of Arms, which is in turn surrounded by the Royal Couples official titles. Your coin will arrive ready to display in its carefully prepared wooden presentation case, accompanied by the Certificate of Authenticity. When you consider that and the high level of interest around the world for Royal collectables, especially during an event as significant this, 995 simply won’t be enough to satisfy demand.